Imagine this: in 2010, Munich will be celebrating the 200th anniversary of its world-famous Oktoberfest! That brings up the topic of beer---and particularly German beer. In Germany, going green when it comes to beer and wine production isn't a trend---it's a century-old tradition and a central part of quality. The German Purity Law for beer, signed by Duke Wilhelm IV of Bavaria in 1516, is the oldest food regulation in the world. It remains the law for every beer brewed in Germany today (see a translation of the law below). Known as Reinheitsgebot, the law decreed that only pure and essential ingredients be used when making beer. Only three ingredients allowed were allowed: barley, hops and water. Today, of course, yeast is also recognized as a vital ingredient. Yeast was a brewing element whose effect was not understood at the time the law was written. 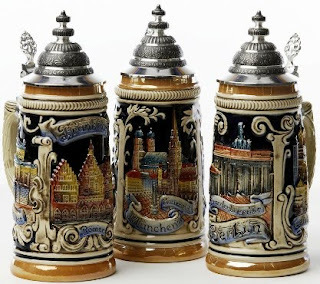 As a result of the Reinheitsgebot, German beer became renowned for its quality and consistency, a reputation it holds to this day. More than 900 breweries operate in Germany and they all adhere to the purity law. We hereby proclaim and decree, by Authority of our Province, that henceforth in the Duchy of Bavaria, in the country as well as in the cities and marketplaces, the following rules apply to the sale of beer: From Michaelmas to Georgi, the price for one Mass [Bavarian Liter 1,069] or one Kopf [bowl-shaped container for fluids, not quite one Mass], is not to exceed one Pfennig Munich value, and From Georgi to Michaelmas, the Mass shall not be sold for more than two Pfennig of the same value, the Kopf not more than three Heller [Heller usually one-half Pfennig]. If this not be adhered to, the punishment stated below shall be administered. Should any person brew, or otherwise have, other beer than March beer, it is not to be sold any higher than one Pfennig per Mass. Furthermore, we wish to emphasize that in future in all cities, markets and in the country, the only ingredients used for the brewing of beer must be Barley, Hops and Water. Whosoever knowingly disregards or transgresses upon this ordinance, shall be punished by the Court authorities' confiscating such barrels of beer, without fail. Should, however, an innkeeper in the country, city or markets buy two or three pails of beer (containing 60 Mass) and sell it again to the common peasantry, he alone shall be permitted to charge one Heller more for the Mass of the Kopf, than mentioned above. Furthermore, should there arise a scarcity and subsequent price increase of the barley (also considering that the times of harvest differ, due to location), WE, the Bavarian Duchy, shall have the right to order curtailments for the good of all concerned." Signed: Duke Wilhelm IV of Bavaria on April 23, 1516 in Ingolstadt. Learn more about the German purity law for beer.